Yes! 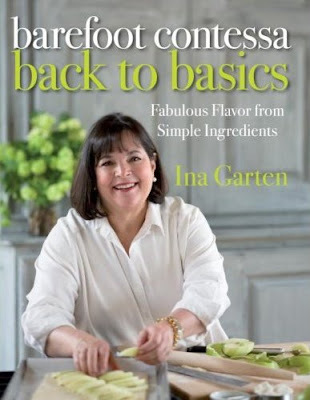 Just in time for my anniversary, ahem (yes my sweet husband reads my silly blog) Ina Garten is releasing a new book- Barefoot Contessa Back to Basics. So until October, check out the Barefoot Bloggers and join us in making Ina's fabulous recipes. 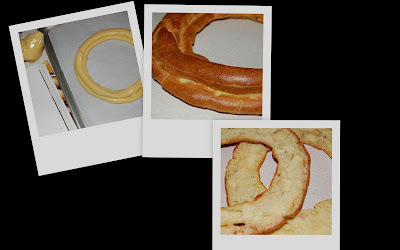 This week's Barefoot Bloggers recipe was chosen by Megan and it was a great choice! I have to say, I've made this chicken several times and love it every time. So while this wasn't something new for me, it was fun to have a good excuse to make it again. Ina recommends serving this with a lemon vinaigrette but I prefer Emeril's basic balsamic vinaigrette and think it's a good, tangy complement to this chicken. Another good variation is to pound out the chicken and make it into chicken cordon bleu. Yum. My best friend Robyn makes the BEST berry pies. So when I saw this recipe, I immediately thought of her and hoped it would be as tasty as her pie. It was! Dorie recommends mixed berries but not strawberries because they can be too watery. I used a blueberry, raspberry, blackberry mix of frozen berries from Trader Joe's. They weren't too liquidy and were really flavorful. I wanted something very little so I made about 1/2 a recipe and rolled the dough out into little circles (about 5 inches in diameter) and pushed them into buttered muffin tins. Then, I put the berry mixture in and baked them for about 15 minutes. They were juicy, bright, and gorgeous! So... might as well add whipped cream, right? I threw on a little lime zest, to emphasize the lime in the berry filling, and they were beautiful. Tasty, too. Seriously, Dorie is a genius. I've never had a cook book that so consistently works out. With my extra berry filling, I made little hand pies from my favorite pie crust recipe. I used Ultra Gel to thicken them and it worked like a charm. If you haven't tried this stuff, you should- it's amazing. This weeks recipe was chosen by Beth and it was delicious, like everything I've tried from Baking by Dorie Greenspan. You can see the recipe on Beth's site and you should really buy the book. I'll try to have my easy, no fail Pie Crust up soon along with pictures of my hand pies. Another yummy Tuesdays with Dorie- next week it's Apple Cheddar Scones! Wow, can I tell you how excited I was to make this treat? Yesterday was my cousins 30th birthday so I volunteered to make it for the party. We had to postpone the party, though I had already made this, so we ended up eating this extraordinary dessert on a normal, Monday night. I've made cream puffs before (see post below) so I was excited to try a new shape and new technique (my other recipe doesn't use a mixer). I loved making the ring and even had extra to make some cream puffs so it was the best of both worlds. Last week I saw Alton Brown's Good Eats episode featuring Pate a Choux and followed his advise and just used a gallon baggie to pipe out the dough. I didn't even use a tip, since I didn't have a plain one big enough. It worked out great and required zero clean up! I thought the flavor of the mint was perfect- subtle, refreshing, and light. I decorated the top of my cream puff ring with mini York Peppermint Patties. They were a nice little addition flavor wise and super cute. One of my favorite things about this dessert was how over-the-top it looked, while still tasting kind of homey and simple. I also made a banana whipped cream filling for the cream puffs and decided to drop them off for Spencer for a little birthday treat (he loves Banana cream pie). I whipped 1/2 cup of cream, added a little powdered sugar, some vanilla, and one ripe, mushed banana to make the banana whipped cream. 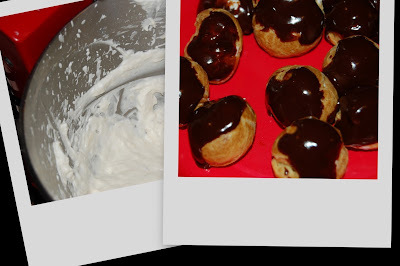 Then, I piped in the cream with a small star tip fitted to a pastry bag and dipped the cream puffs in the rest of the chocolate glaze. A little dusting of powdered sugar and they were beautiful! I hope he liked them! Thanks to Caroline for choosing such a fun and tasty recipe. The recipe can be found on her blog or at Epicurious. Next week's recipe is Mixed Berry Cobbler- I can't wait! Check out my new baby. Only $64.99 at Macy*s after all the smoking deals. It's a good thing I'm going camping this weekend or we might be eating pesto, pastries, and graham-cracker crust tasties all weekend long. As it is, I can hardly stand making something that doesn't require it's immediate use. Since I'm also trying to prove it's worth to my skeptics, please leave a comment and let me know what your favorite thing is to make in your food processor. So long, 1 1/2 cup Cheftmate- Hello, Cuisinart!